More photos are on the BCPC Facebook page. The 5th annual BCPC Team Championships kicked off just after noon on Saturday March 7th with a record 20 teams of 5 players giving us a Club-Record prizepool of £3000. The venue was moved to The New Britannia from the regular New Talbot as the amount of players this year would have been too much for them to cope with and initial reaction of everyone was good. The first round of games are always cagey as the alcohol has not yet kicked in and only 5 “Wild-Cards” were in play. From these, only Kev O’Driscoll of the BCPC “A” made his count, winning table 6 to score a maximum 20 points while Poker Mob “B” player Richard Latham took out Wild Card Sean Priest in 5th on table 8 and went on to win to also score the maximum 20 points. Julie Whitworth (Angies Room “A”), Darrell Hewitt (Angies Room “B”) and late replacement Ashley Hall (Poker Mob “D”) all drew a blank. Pre-Tournament favourites Poker Mob “A” made a great start with Captain Gary Peniket leading from the front by taking down a marathon on an ultra-tough Table 4. Alan MacDonald was 2nd on table 5 while Caroline Cove, Matt McKinlay and Darren Sprengers all weighed in with 4 points to give them 29 points, a total bettered only by the BCPC “A” on 30 and leaders Sky Hit Squad on 31, for whom both David Behan and David Harvey won their respective tables. Many Captains were leading by example as Tony Griffiths (Old Goths Never Die) & Graham Gorton (Raven) joined Peniket in winning round one while Real Men Wear Pink also had two victories with both Robert Douras and Steve Watkins doing the business. Only one team drew 5 bagels in Round One and that was Cowboys & Indians while holders BCPC Double “D” also made a poor start, lying equal 14th with just 7 points coming from Adam Smith’s 2nd on table 9. Into Round Two and Real Men Wear Pink collapsed, scoring zero points, while APAT “A” produced the highest scoring round of the day, netting 41 points as Ger Smyth took out Wild Card Bobby Bahra and went onto win table Table 8. Glenn Lamming almost followed suit as the team’s Wild Card on table 7 but was thwarted Heads-Up by Forum Voyage In Poker’s Val Morris. Stu Ward also weighed in with a second place on table one but couldn’t defeat Sky’s David Behan, who followed up his win in Round One with another in round two, only this time he also took out Wild Card Andrew Whitehouse to give him 30 points total and the individual lead after two games. Behan’s 20 point haul helped Sky Hit Squad to 30 in round 2 after Max Ball also added a victory and that took them to 61 points and kept them ahead by 4 points from BCPC “A”, for whom Brian Yates knocked out Wild Card Steve Smart before going on to win Table 10. Poker Mob “B” remained in the hunt with 4 of their 5 players scoring but the Mob “A” team collapsed as just Gary Peniket with a single point troubled the scorers. Bobby Bahra’s 2nd place as the Cowboys & Indians Wild Card got them off the mark and off the bottom of the table but once again, none of their other players troubled the scorers. That left the top of the table like this…. 1. SKY HIT SQUAD 61 2. BCPC “A” 57, 3. APAT “A” 51, 4. POKER MOB “B” 49, 5. FORUM VOYAGE IN POKER 37. Round 3 kicked off close to 9pm and by now the beer had well and truly kicked in for some of the players. Individual leader David Behan was going for an unprecedented 3 wins out of 3 but exited table 10 early in 8th spot. Brian Yates took advantage of this, knocking out Wild Card Adam Smith in 4th in a 3-way pot before losing Heads-Up to Simon Smith (Raven) to lock up 14 points for an individual total of 36. Would that be enough to lift the individual Title? Well Poker Mob “B” player Richard Lathan took out Wild Card Julie Holloway in 5th on table 2 and then needed at least a 2nd place finish to pass Yates’s total. He went one better by winning that table, securing 20 points for the 2nd time in 3 games and added to his 2nd place finish in game 2, that gave him 47 points for the individual Title plus £125. Round 3 was a great one for BCPC players as Paul Foy (beating Wild Card Robert Douras Heads-Up), Andrew Duncan, Adam Phelan and Tony Trippier were all table winners. Tod Wood and Steve Healey both ground out 2nd places on their respective tables to give the BCPC “A” a superb 38-point haul in round 3 to take them to a record 95 points which proved good enough to lift the trophy by 17 points from Poker Mob “B” in 2nd while an awful final round score of 8 points saw Sky finish in 3rd spot, just ahead of the BCPC “B” in 4th, who got better and better as the tournament progressed. On reflection the tournament was a roaring success and undoubtedly the best yet run by the BCPC. 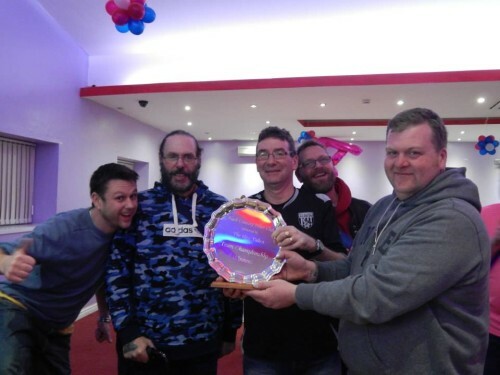 It should see a lot of the players returning in July for the Deepstack and hopefully again next year when the BCPC will try to keep the trophy at the Club for a 4th consecutive season.